New York is famous for its scenic roadways, and a motorcycle puts you in the middle like no other form of travel. Every sense comes alive as you climb, bank and cruise through mountain and farmland, lakefront and forest. Spend a few hours or days motoring the state’s Scenic Byways for new vistas with every curve of the road. Shadowing the St. Lawrence Seaway, the Great Lakes Seaway Trail rolls by Niagara Falls into the Thousand Islands region with 29 lighthouses along the way. The Lakes to Locks Passage between Manhattan and Montreal and the Mohawk Towpath Byway are drive-through history museums of canals, battlegrounds, and stately architecture. Between Rochester and Buffalo, vast Letchworth State Park is called the Grand Canyon of the East with magnificent views. Lakes country cruisers can circumnavigate Cayuga Lake for glittering views, rolling through Taughannock Falls State Park and past the tallest shear-drop waterfall east of the Rockies. Route 10 between Walton and Deposit is one of the most scenic stretches in the state. Websites like Motorcycle Roads suggest themed runs from day outings to several-day odysseys. The Montauk Lighthouse Run from Holbrook to Montauk Point passes wine orchards and farms with plenty of Long Island wildlife and ends at Montauk Lighthouse where a tour awaits. 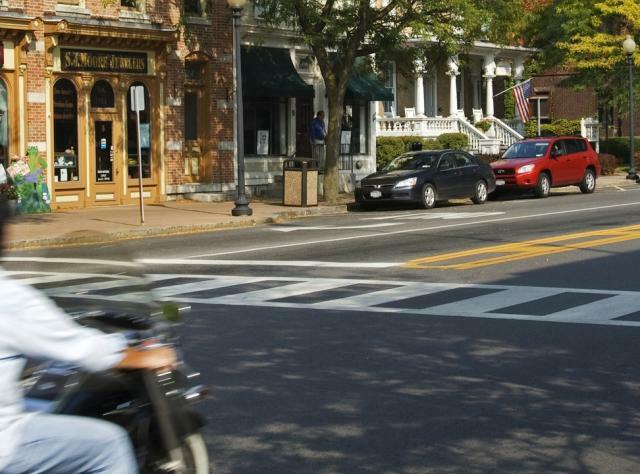 You can spend several days exploring haunted roads on a Sleepy Hollow tour with a stop at the infamous cemetery, through Washington Irving country’s misty back roads and covered bridges. Few sporting groups are as social as the motorcycle community, and special shows and events, rallies and poker runs line the state. 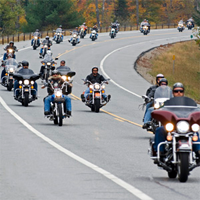 One of the biggest is Americade that annually sees Lake George swarming with bikes; the world&apos;s largest multi-brand motorcycle touring rally offers guided mini-tours, parades and plenty of noise. The Warrensburg Bike Rally is another family-friendly event. You’ll find scores more rides, clinics, charity runs and swap meets at websites like New York Motorcycle Rallies. New to motorcycling? The New York State Motorcycle Safety Program (NYSMSP) offers basic to advanced instruction that can get you wheeling in no time. The program trains 16,000 motorcyclists each year at over 20 training sites throughout the state.